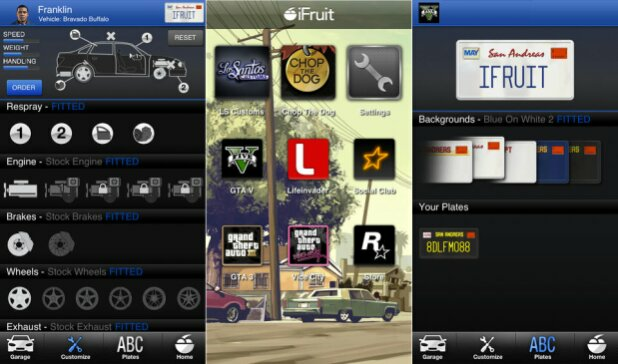 Rockstar may be a little late in the day to win Android fans back over but at least they have finally released the iFruit companion app for GTA V on Google Play. It has now been over a month since the epic game that is GTA V launched and those who use iOS devices got access to the iFruit app the same day. So if you don’t know what this app will bring then lets have a look. The app itself allows you to sign in with your Rock Star Social Club account and connects with your GTA V experience. It doesn’t matter if your on Xbox 360 or PS3 you still get to modify your in-game vehicles, buy a custom licenese plate and even train Chop. Yes you can actually train your in-game dog and it brings back memory’s of those cyber pets from my childhood as you can feed him, train him or even just go for a walk. The reason behind all of this is Chop will then perform a little better in the game. The app is working fine on our devices but there are some reports on incomparability so you’ll have to hot the link below and check. Either way its a worthy download if you love playing GTA V.